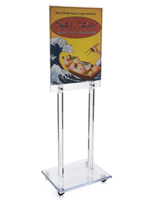 Acrylic Display with Poster Frame 22" x 28"
Acrylic Display - This acrylic display for posters stands 67" tall and holds (2) 22"w x 28"h posters back-to-back for double sided viewing. 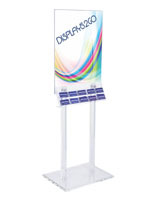 It is one of our most popular floor poster stands. 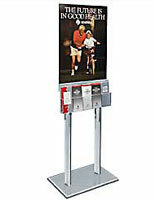 This poster display is field tested and a proven winner! Easy assembly, all hardware provided for this display. Ships in two boxes. 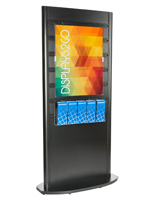 Upscale, thick, polished clear acrylic draws attention to your posters and brochures! Base dimensions are 24" wide by 18" deep. 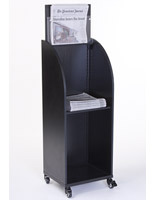 Also available with brochure/magazine pocket attachments and/or custom headers, see related products below. 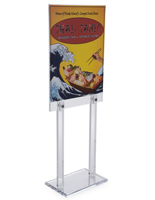 The 22 x 28 Poster Stand for Floor, Double Sided, 67 inches tall - Clear Acrylic is a great display choice for our marketing purposes. 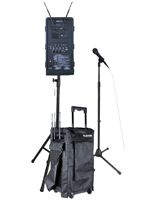 Very clean and professional looking item. Thanks for the feedback, Teresa!